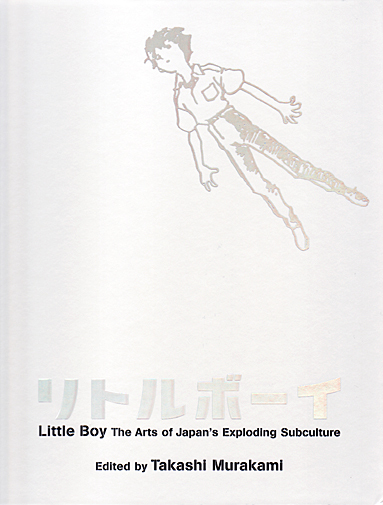 Little Boy is most definitely the contemporary Japanese art exhibition catalog to end all art exhibition catalogs. It quickly sold out when it was first released, and secondhand copies now sell for ridiculous amounts of money. The Japan Society of New York has finally released a softcover edition, which it sells in its headquarters in New York City. The new edition is just as gorgeous and well put together as the original hardcover version; so, if it’s at all possible for you to acquire one, go for it! Quickly! Do it now! Before you even start reading this review! Yes, it’s that good. The first one hundred or so pages of this catalog feature full color plates of various artworks, photographs, and screen stills. Through these plates, pop artist extraordinaire Murakami Takashi attempts to demonstrate in images the thesis of his introductory essay “Earth in my Window.” Murakami’s main argument can be summarized in two points. First, the Pacific War, especially the two atomic bombs that ended it, left an indelible scar on the Japanese psyche. Second, the experience of having been defeated in war and thereafter occupied by America has turned multiple generations of Japanese people into perpetual children. The first point is illustrated by plates demonstrating recurring nuclear imagery in films and television serials such as Akira and Neon Genesis Evangelion and various tokusatsu (“special effects”) films released by Tōhō Studios, as well as in the artistic output of artists like Yanobe Kenji and Murakami himself. The second point is easily demonstrable by the overtly cartoonish and childlike work of artists such as Nara Yoshitomo, Ban Chinatsu, and Mr., as well as by the designs of popular and festishized kyara (“characters”) like Hello Kitty. Following these images and explanatory essay is a short manifesto penned by Murakami to support his superflat art movement, which is apparently based on the idea that contemporary Japan needs art that reflects its current cultural status of being awash in meaningless junk. Next up is a transcription of a conversation between Okada Toshio and Morikawa Kaichirō (two self-proclaimed experts of “otakuology”) moderated by Murakami. Morikawa in particular states that otaku are characterized by an obsession with things that are dame (absolutely useless), whether it’s collecting antique model kits or falling in love with moe (young and innocent) characters. Okada seems to have a somewhat more optimistic view of otaku, who he thinks are simply resorting to childish things in order to escape a meaningless and unforgiving life. This conversation is superbly illustrated by images of the cultural paraphernalia the two men mention, and it also includes several dozen footnotes explaining their various obscure otaku references. Following this conversation are two academic essays by Japanese scholars, Sawaragi Noi and Matsui Midori. Sawaragi discusses how the Pacific War has filtered through Japanese pop culture in movies like the Godzilla and Space Battleship Yamato series, and Matsui discusses the subculture of kawaii (“cute”) in postwar Japan, especially in terms of how it is connected to art depicting women and art by women artists like Takano Aya and Mizuno Junko. Following these two essays by Japanese authors are two essays by American authors, Alexandra Munroe and Tom Eccles. Munroe offers a history of otaku subculture from the perspective of a Western observer, and Eccles attempts to situate the superflat movement with the history of Western pop art. All of these essays (as well as everything else in the catalog) are presented in both English and Japanese, with a column of English text on the left and a column of Japanese text on the right. Finally, the “Further Readings” section at the end of the book is an invaluable six-page bibliography of related works in both English and Japanese. In short, Little Boy is gorgeous, fun, and intelligent. The dual language presentation is unobtrusive for readers of one language but wonderful for readers of both. Murakami’s presentation of Japanese culture itself is both extremely interesting and highly controversial. This catalog is a work of art and an object of culture in and of itself. No matter what your field of interest is, I highly recommend picking up a copy before they’re all gone. Previous Post Shojo Manga! Girl Power! I picked up a copy of this book a few years ago ,it’s a really great book, i’m going to have a look through again soon!. It is a fine book indeed. I wish I had not missed the exhibit itself. Haven’t yet read through all the essays, but it definitely touches upon a great many artists and other producers good to know about, and in concert with essays by Sawaragi, Matsui, and others in other books on Murakami (such as the far thinner catalog The Meaning of the Nonsense of the Meaning; 意味の無意味の意味), it has some really fascinating insights into Japanese pop culture and society, and the ways these themes are expressed or reflected in contemporary art. I’m quite glad to have it on my shelf, but by itself I don’t really find it to be the contemporary art/culture bible/encyclopedia/go-to source that I might have thought it to be. Hm, how can I check if they still have the book in stock, email them? I was unable to find anything of use on their website, might have missed it. But of course you can always email (or phone) the Japan Society of New York. They’re good people, and they generally respond very quickly when I email them about something. If that doesn’t work, you can also try the co-publisher, Yale University Press. Good luck! I hope you don’t mind me jumping in here, Kathryn. The Japan Society’s physical shop (i.e. the store physically located within their building in NY) closed a few years ago. But, as Kathryn points out, they are in fact nice people and I’m sure if you called or emailed, they’d get back to you quickly. Meanwhile, though the shop is no longer, they are selling their books as an Amazon Merchant. Little Boy is apparently currently going for $45 softcover, $65 hardcover. Oh thanks for the quick reply, darn they have both versions, oh the choices. I think I’ll email them and ask, I recently got ganetchu from the german filminstitute and they we really nice. Thanks.